Ravulizumab (ravulizumab-cwvz; ULTOMIRIS™), a humanized monoclonal antibody, is a complement C5 inhibitor developed by Alexion Pharmaceuticals for the treatment of paroxysmal nocturnal haemoglobinuria (PNH) and atypical haemolytic uraemic syndrome (aHUS). Like the first-generation C5 inhibitor, eculizumab, ravulizumab binds specifically and with high affinity to the complement protein C5, thereby preventing formation of the terminal complement complex C5b-9, which mediates cell lysis. In December 2018, intravenous ravulizumab received its first global approval in the USA for the treatment of adults with PNH, and is under regulatory review in the European Union and Japan in this indication. Phase 3 development of intravenous ravulizumab for the treatment of aHUS is underway worldwide. The use of ravulizumab in myasthenia gravis and IgA nephropathy is also being evaluated in the USA in early-phase and preclinical studies, respectively. Clinical development of a subcutaneous formulation for PNH and aHUS is also underway. Ravulizumab has been developed using Xencor’s antibody half-life prolongation technology (Xtend™), which utilises antibody Fc variants to prolong half-life. Alexion is also evaluating the coadministration of subcutaneous ravulizumab with Halozyme’s ENHANZE® drug-delivery technology (rHuPH20), which may have the potential to further extend the dosing interval. This article summarizes the milestones in the development of ravulizumab leading to this first approval for PNH. During the peer review process the manufacturer of the agent under review was offered an opportunity to comment on the article. Changes resulting from any comments received were made by the authors on the basis of scientific completeness and accuracy. Kate McKeage is a contracted employee of Adis/Springer, is responsible for the article content and declares no relevant conflicts of interest. US Food and Drug Administration. FDA approves ravulizumab-cwvz for paroxysmal nocturnal hemoglobinuria [media release] [media release]. Dec 21 2018. https://www.fda.gov/Drugs/InformationOnDrugs/ApprovedDrugs/ucm629088.htm. Alexion Pharmaceuticals Inc. ULTOMIRIS™ (Ravulizumab-cwvz): US Prescribing Information. 2018. https://www.accessdata.fda.gov/drugsatfda_docs/label/2018/761108s000lbl.pdf. Accessed Jan 7 2019. Alexion Pharmaceuticals. Soliris® (eculizumab): US prescribing information. 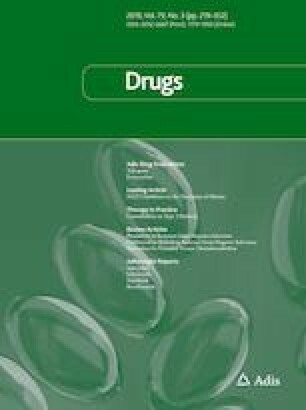 2011. https://www.accessdata.fda.gov/drugsatfda_docs/label/2011/125166s172lbl.pdf. Accessed 1 Feb 2019. Alexion Pharmaceuticals. Soliris (eculizumab): EU summary of product characteristics. 2012. https://www.ema.europa.eu/documents/product-information/soliris-epar-product-information_en.pdf. Accessed 1 Feb 2019. Lee JW, Sicre de Fontbrune F, Wong Lee Lee L, et al. Ravulizumab (ALXN1210) vs eculizumab in adult patients with PNH naive to complement inhibitors: the 301 study. Blood. 2018. https://doi.org/10.1182/blood-2018-09-876136. Kulasekararaj AG, Hill A, Rottinghaus ST, et al. Ravulizumab (ALXN1210) vs eculizumab in C5-inhibitor-experienced adult patients with PNH: the 302 study. Blood. 2018. https://doi.org/10.1182/blood-2018-09-876805. Alexion Pharmaceuticals. Alexion announces positive top-line results from phase 3 study of ULTOMIRIS™ (ravulizumab-cwvz) in complement inhibitor-naïve patients with atypical Hemolytic Uremic Syndrome (aHUS) [media release]. Jan 28 2019. https://news.alexion.com/press-release/product-news/alexion-announces-positive-top-line-results-phase-3-study-ultomiris-ravul.